We are all curious beings; it’s what makes us human. A desire to know, see, hear, smell, taste and touch connects our race and helps us to define our everyday experience. As advertising has developed over the centuries and the competition of consumerism reaches an all time high, companies are now hungrier than ever to understand human behaviour and how they can influence decision making to turn us into willing consumers of their brand, service or product. And that’s where cognitive neuroscience comes in. A sub-field of neuroscience, its popularity has increased over recent years as it aims to explore how we (humans) use our brains to interact with our everyday environment. Such understanding of human behaviour by advertisers could result in unprecedented access to the consumer’s unconscious brain, revealing hidden elements of our instinctive processes, processes that have historically been difficult to measure. How has Cognitive Neuroscience affected the Advertising Industry? In the early 1950’s scientists discovered an area in rodent brains that triggered pleasure. From then on companies sought to target these so called ‘pleasure centres’ in the minds of their own consumers. Studies such as this gave way to the rise of ‘neuromarketing,’ the study of consumer’s sensory, cogntive, motor and affective responses to marketing stimuli. Aided by various neuroimaging techniques such as functional magnetic resonance imaging (fMRI), and electroencephalography (EEG), techniques started to be employed by organisations to measure neural brain activity and understand where this activity resonated from. Neuromarketing has been instrumental in helping brands and advertisers to create smarter and more effective marketing campaigns. By detecting processes that are not consciously perceived by the subject, campaigns have managed to tap into knee-jerk reactions, perspectives or feelings of a consumer – that other organisations don’t have access to. For example, for years baby advertising has used babies at the forefront of their campaigns. But in 2009 neuromarketing alone was responsible for revealing the importance of ‘the eye gaze’ within the baby product market. 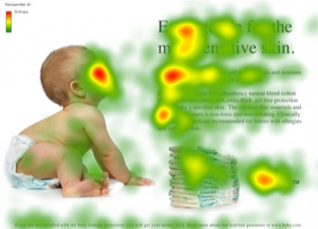 Through the use of eye tracking, research found that babies facing forward within advertisements distracted the viewers, with content being ignored. Instead findings showed that if the child gazed in the direction of the important information consumers are more likely to engage and digest the information. It’s not just baby brands who use neuromarketing, more and more major brands are also turning to an indepth analysis of human behaviour to stay ahead of the consumer game. PayPal for example has found that promoting the speed of their service is more emotionally appealing to the consumer than promoting information security as it had advertised previously. Hyundai also asked consumers to look at specific parts of their cars whilst wearing EEG caps to show consumer preferences. Even Coca-Cola has used EEG to track consumer activity whilst watching various advertisements. In summary; neuromarketing gives organisations and advertisers a fresh viewpoint from which to develop and fine tune our creative communications. Through a deeper understanding of the emotional triggers that influence consumer behaviour we not only have a better chance of producing effective campaigns but also an opportunity to learn much more about our own race and being. And as the saying goes – with great opportunity comes great responsibility, it will be down to organisations and advertisers to navigate through this unchartered territory both morally and ethically.